The business is run by Glennys Pollock who believes in using wholesome quality ingredients, old family recipes handed down through the generations, and our own unique recipes, to produce pickles and preserves that may not be found in your local supermarket. All our pickles, chutneys and jams are handmade in small batches, to retain the full freshness and flavour, using standard kitchen equipment as you would use in your own home. All our ingredients are free from artificial colours, artificial flavourings and preservatives.Our products have won considerable praise and awards from shows and fairs nationwide. 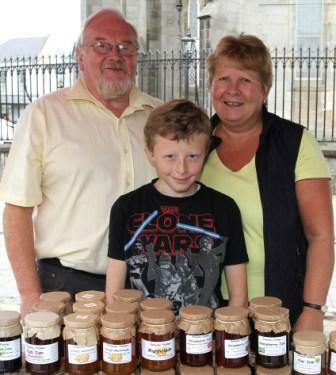 Pollocks’ Homemade Pickles and Preserves are proud to be members of Monaghan Farmers’ Market and look forward to meeting you at the market each Friday morning. For more details visit our website www.pollockspickles.com.